we like to think of this cute kate spade new york scallop tracker as a personal cheerleader: it links automatically to the kate spade new york connected app to provide bursts of motivation, celebrations with every success and the tools to stay stylishly organized. track your steps, sleep and other habits, set personal goals, count down to life’s merriest moments (big and small!) and get inspired every single day. 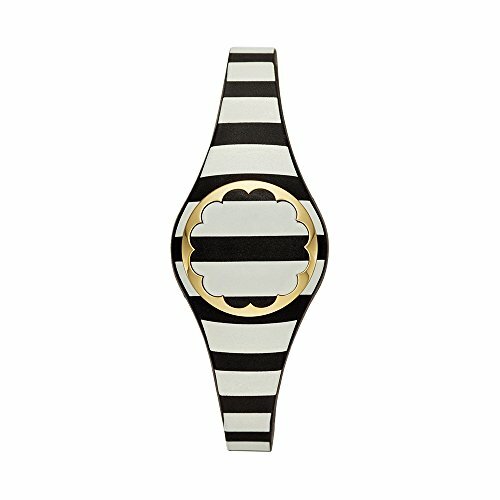 your tracker alerts you with light notifications, controls music, takes selfies and never needs charging—and, with a black-and-cream striped polyurethane strap, a bow closure and dainty scalloped gold-tone topring, it’s as chic as it is functional. your tracker alerts you with light notifications, controls music, takes selfies and never needs charging-and, with a black-and-cream striped polyurethane strap, a bow closure and dainty scalloped gold-tone topring, it's as chic as it is functional.